(CNSNews.com) – The Trump administration admitted a total of 22,491 refugees into the United States during fiscal year 2018 – by a sizeable margin the lowest number in the history of the 38-year-old modern refugee resettlement program. The next smallest number of refugees resettled since passage of the Refugee Act in 1980 was 27,131 in FY 2002, the financial year that began just weeks after the 9/11 terrorist attacks. A majority of the 22,491 refugees admitted in FY 2018 – 16,023, or 71.2 percent – were Christians of various denominations, including Catholics, Baptists, Pentecostalists and evangelicals. Muslims, including Sunnis, Shi’ites and Ahmadis, accounted for 3,495, or 15.5 percent of the total, while the remainder included 1,139 Buddhists (5.0 percent), 672 Hindus (2.9 percent), 425 Kiratis (1.8 percent), 119 Jews (0.5 percent) and smaller numbers of Yazidis, Baha’i, animists, atheists and others. The Christian-Muslim ratio (71.2 percent to 15.5 percent) has changed significantly under this administration. In FY 2016, the last full fiscal year of the Obama administration, 44.5 percent of the refugees resettled in the U.S. were Christians and 45.7 percent were Muslims. 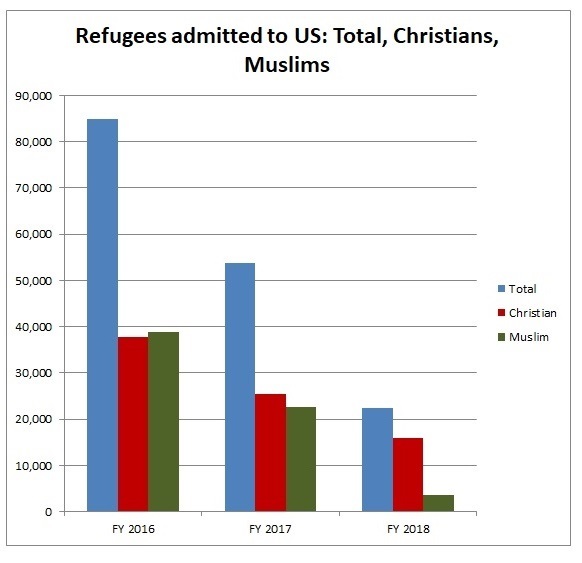 Prior to FY 2016, over the previous decade and a half more Christians than Muslims were admitted as refugees, by a proportion of roughly 46-33 percent. --Bhutan: 2,228, of whom 32 percent were Buddhists, 30 percent Hindus, 20 percent Christians and 19 percent Kiratis. According to the 1951 Refugee Convention, the five criteria for considering refugee status applications are persecution for reasons of religion, race, nationality, political opinion or membership of a particular social group. When it comes to religion, Christians are by far the most persecuted group worldwide. According to Open Doors USA, 215 million Christians around the world, or one in 12, experience high levels of persecution. In the advocacy group’s latest annual list of “countries where it is most dangerous to follow Jesus,” 36 of the top 50 countries are members of the Organization of Islamic Cooperation (OIC), the bloc of Muslim-majority states. They include eight of the ten topping the list of persecutors. Although the proportion of Christians among the refugees admitted to the U.S. rose markedly in FY 2018 compared to earlier years, the number of Christian refugees resettled during the year – 16,023 – was considerably smaller than the 25,353 Christians admitted in FY 2017 (when the overall refugee intake was 53,716), and the 37,822 Christians admitted in FY 2016 (when a total of 84,994 were admitted). Of the ten countries that top Open Doors’ 2018 world watch list only one, Eritrea, accounted for a sizeable number of Christian refugees admitted to the U.S. in FY 2018: Of a total of 1,269 Eritrean refugees resettled, 1,012 (79.7 percent) were Christians. After Secretary of State Mike Pompeo last month announced a proposed record-low ceiling of 30,000 refugee admissions in FY 2019 – down from a 45,000 cap in FY 2018 – a group of evangelical leaders urged the administration to reconsider, citing the effect on persecuted religious minorities in general and Christians in particular. In an earlier letter to Pompeo, Homeland Security Secretary Kirstjen Nielsen and ambassador-at-large for international religious freedom, Sam Brownback, the evangelical leaders called for a FY 2019 refugee admission ceiling of 75,000. “[C]uts to our refugee admission program affect all persecuted religious minorities, but these cuts significantly impact our persecuted brothers and sisters in Christ,” they wrote. The State Department has said the final ceiling for FY 2019 will be determined by President Trump, following statutorily required consultation with Congress, and that it could change from the initial number proposed.